Nina Kluth, Foundation Gulbekian 3 (detail), 2008, acrylic and oil on canvas, 66 x 70 4/5". Nina Kluth’s paintings entail a dappled yet fluid fragmentation of pictorial space. She joins gestural abstraction with the imagination of landscape and fascinatingly binds the two together so that neither the abstraction nor the object’s representation can be distinguished. The immense variety of abstract dabs, sprinkles, and strokes of paint in her works suggests vegetation. Kluth organizes her brushstrokes such that the image appears to come alive as soon as it is viewed. This tension produces an effect that could never be achieved by realist means. The viewer may recognize overgrown paths in parks, pathetic urban plant life, or impenetrable undergrowth in Kluth’s paintings, which are often expressly anti-illusionistic. She depicts wildly overgrown vines and thick and shadowy clusters of branches, and one may even feel the light breeze that sets everything in trembling motion. More than in her earlier work, in this exhibition Kluth juxtaposes form and color in a raw and direct way, so that densely painted areas contrast with empty space or dapples that appear resolutely large. In Herbstwald (Autumn Forest), 2009, for example, Kluth adds rich oil paint to a less lustrous acrylic base. Although her representations are loosely rendered, her motifs are never pure invention: Kluth typically paints the places named in the titles. 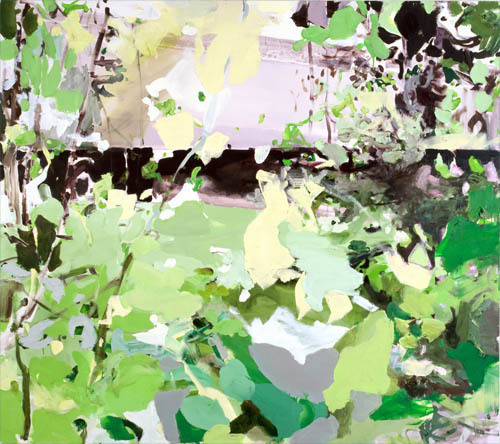 In works like Gartenanlage Ibsenstrasse (Ibsen Street Gardens), 2009, and Foundation Gulbekian 3, 2008, Kluth succeeds in joining abstraction, which entails pure surfaces, with illusion rich in diffuse color and spatial perspective, thereby demonstrating that painting can truly develop only when both elements are engaged.